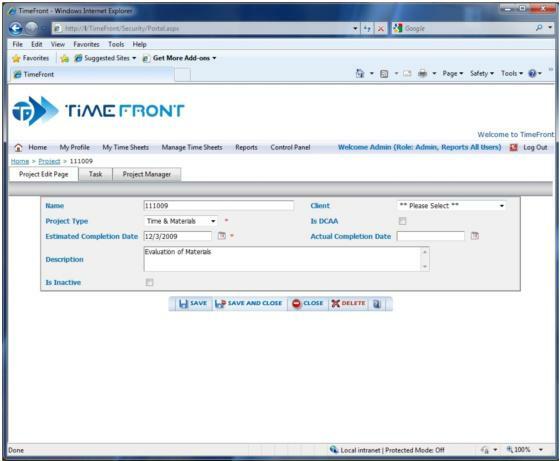 The Time Front application was designed for Allwood Consulting for internal use. The application helps managers track employee projects and encourages employees to utilize their time more efficiently. 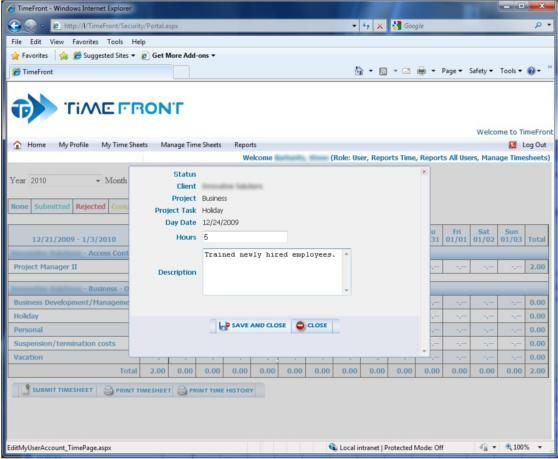 When an employee begins a project, he logs in to Time Front and documents it. All employees follow strict procedures for entering or modifying data into the application. Managers can log in to the system and approve or reject the employees' entered times. The appropriate details for each user are displayed at run time based on the projects and tasks assigned. System administrators can send notification messages to application users when their entries are approved or rejected. These messages must be acknowledged by the user before they are granted access to the application. The application also builds reports using a custom ad hoc report generator. These reports are designed and distributed at run time and can be exported in various formats. The application utilizes role-based security. Users and roles are easily added to the system at run time. Once created, roles are given modules of access which determine what permissions the user-role can perform on a given page. The Custom Tab Manager evaluates user permissions and displays, or omits, tabs accordingly. The AC Time Keeper application accesses one Microsoft SQL Server database, which is comprised of 54 tables, 75 views, and 150 Web pages. The UserAccount_Time table is the largest table in the database. There are approximately 100 users processing 10,000 transactions every month. It only took one week for me to complete the Iron Speed Designer portion of this project. I spent six weeks on additional customization and application deployment. I wrote 1,500 lines of custom code over the course of six weeks. Modified XSL templates to allow custom controls and functionality on every page. Custom coded time entry pages which are integrated with Telerik Tooltip controls. Modified security model to support dynamic roles and user accounts. Implemented custom grid pages based on DevExpress grid control. In addition to these customizations, I incorporated several third-party controls, they include: Telerik, DevExpress, and Izenda. Dynamic help on application pages. I saved, easily, four months of work by using Iron Speed Designer. I saved $40,000 of my development cost by using Iron Speed Designer. Without Iron Speed Designer, this project would have taken me at least six months to complete. It would have been feasible for me to do it all by hand, but would have taken longer and cost more for the client. I do plan to extend the application in the future using Iron Speed Designer. Eventually, more users will access the application, and we will deploy additional sites. Jason is so enthusiastic about Iron Speed Designer that he now refuses to create an application without it. He feels all application development is possible using Iron Speed Designer.